The game assumes characters are poor, probably homeless, children living in a City. (My version of this is tuned to an Early Modern European historical setting, but you can easily hack it to some other one.) Somehow, they manage to attain 1st level in some class, and engage in adventuring because, essentially, it beats getting throw into a workhouse or poorhouse or orphanage, and it’s a way to keep their heads above water. 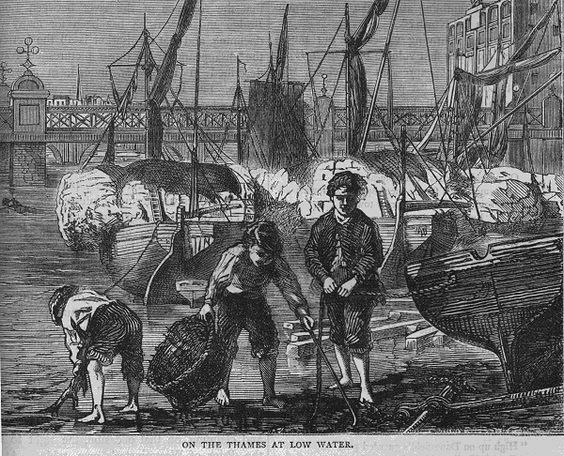 In The City there are several “mudlark guilds,” as in mudlark, the English term for urban poor who took to scavenging as a trade. It’s not necessarily in-game term, though: the guilds can call themselves anything they like. Each mudlark guild consists of a group of urban poor who’ve banded together and taken to adventuring. They tend to group by affinity—one might be a group of young widows, another a band of children escaped from a workhouse, and yet another could be a minor branch of a local thieves’ guild. Still, most end up being catch-alls, and these are the most natural fit for most “adventuring parties.” What all mudlark guilds have in common is the fact they’ve banded together to support the one means they know they can use to pull themselves out of poverty: adventuring. Indirect beneficiaries of the Mudlark Guild’s investments: +2 overall for community members. XP aren’t gained from simply obtaining goods or money; you have to spend or use them. 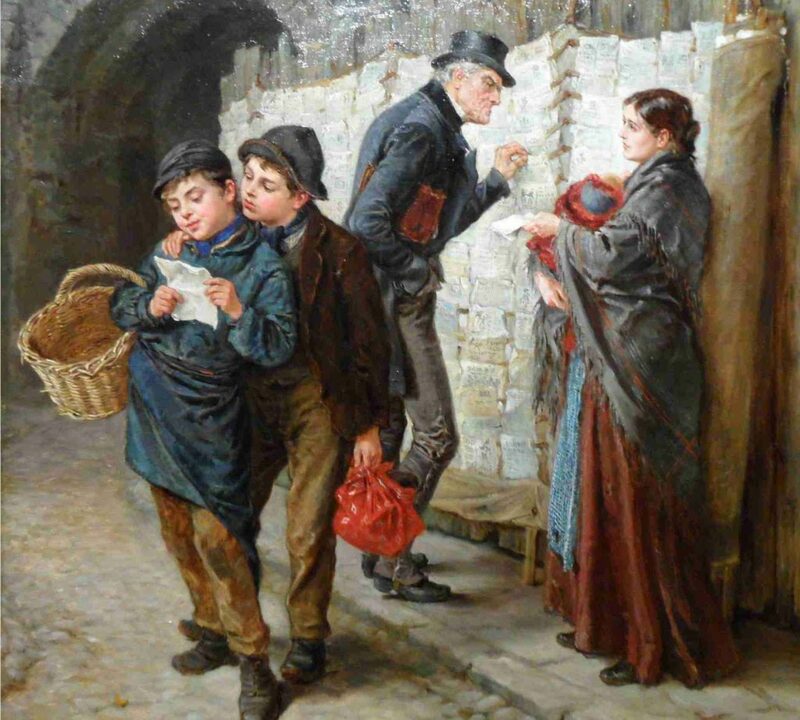 The method used to gain the money is irrelevant—yes, you can pickpocket nobles or rob a Great House—but what does matter is where the money ultimately goes. Only funds or goods spent translate to XP gained. Note that characters are not compelled to spend their money or goods in this way. They don’t absolutely need to do so, though it is probably a safer way of investing their loot than trying to hide it under the floorboards or flip it for wearable jewelry that can be pilfered in their sleep. Most Mudlark Guild members don’t hand over all of their loot to the guild, since they need to provide for their own daily needs and have a buffer to get through lean times. Still, investment in the Mudlark Guild is how characters gain XP and achieve level-based advancement. Characters can also gain XP bonuses (+20%) when they undertake tasks in service to their own Mudlark Guild. *Patronage is separate from for-hire work: an engraver hired to make satirical prints that mock the city treasurer or a writer who’s hired to pen a pamphlet accusing a nobleman of a crime are not being patronized. In these cases, the XP reward may still be gained if the hire truly serves the guild, as opposed to being a fun bit of chicanery or revenge. Patronage means a stipend intended to allow the artist to work on his or her own creative endeavours without specific direction. Of course, this doesn’t prevent characters from seeking out radical, outspoken, or political creators whose views align with their own; but the artist is still a free agent and may create works of which the patron might not approve—possibly even doing so pseudonymously. This list is not exhaustive. Players may think up other ways to invest in the development of their neighborhoods, expanding the list of specific neighbors below, and potentially gaining specific benefits suited to the new developments. Investment in any building, institution, or organization costs 1,000 sp for the first upgrade; the cost doubles for each subsequent investment. There are secondary benefits (beyond receiving XP) for each investment made by the player characters. The primary domicile for members of the Mudlark Guild during downtime, and the primary site of early investment by PCs. Staying here allows the party to regain Hit Points quickly, rerolling a cumulative Hit Die worth of hit points per day; for each 1000sp invested in the Mudlark House, characters can recover one more Hit Die worth of Hit Points per day of rest. The neighborhood blacksmith only makes weapons and armor on request, and each piece takes a week. Initially, the blacksmith can only forge weapons that deal d6 damage or less and make armor with 14 AC or lower. Each investment made by characters allows the blacksmith to forge weapons that deal 1 die step more and make armor with an additional point of AC. In return for any investment, the Smith will perform maintenance and repairs on weapons for free. The local cunning woman is schooled in the ways of illness, folk magic, and fortune: she has a 1 in 6 chance of curing a disease, poison, or curse per week of care. Particularly dangerous poisons, diseases, or curses will also require rare or expensive ingredients. Each upgrade improves the cunning woman’s chance of successfully curing a poison or disease or lifting a curse by 1 in 6. A good neighborhood brewery doesn’t just employ people and minimize the spread of waterborne illness, it also is a cheery thing to have around. Founding a brewery costs 3000sp. Upgrades start at 1000sp thereafter, and each upgrade confers a + bonus to Reaction rolls made with 100′-per-upgrade of the Brewery. For campaigns that are not especially magic-poor, The Old Alchymist is an option. This individual spends most days engaged in experimentation in arcane questions of his discipline, but has a 1 in 6 chance per week of having produced a potion or potion(s) of some use to the party. To determine the potion type, the Referee should roll 1d6 on the following table and apply a bonus of +1 to the result of the roll for each upgrade to his lab funded by the player characters. 6-7 Curative (Heals Combat Damage) To determine curative strength, roll 1d4: 1) cures 1d4hp; 2) cures 1d6hp; 3) cures 1d8hp; 4) cures 1d10hp. As always with magic, caveat emptor: alchymical potions are experimental and may contain toxins, difficult-to-digest ingredients, or have other unintended side effects (such as curses, blindness, spirit possession, or worse). Also note that once the Old Alchymist’s shop is improved to the point where Minor Enchantments are a regular possibility, he will attract attention from Authorities, who will prosecute him for witchcraft or other crimes. A shop in the part of the city where a given mudlark guild lives, and the only shop in the area willing to deal with mudlarks. Sells equipment from the rural goods listed under Miscellaneous in the LotFP handbook. On a given week, there is a 1 in 6 chance of a given item being in stock, of which 1d4 units will be available. Special order costs double, but guarantees availability by the next week. Characters who “tip” extravagantly improve will see an upgrade in the shop and its stocked inventory, increasing the chance of a given item’s availability by 1in 6 per upgrade. A local town square where new and apprentice mudlarks can be recruited. Players can spend an evening telling stories of their adventures and bragging about their guild to attract 1d6-4 potential personal apprentices. Use the LotFP process to determine interest and loyalty. Each upgrade of 1000sp to the square gives a +1 bonus to the number of potential apprentices as the local homeless gravitate to the square; after the bonus cancels out the penalty, the square will be on the Authorities and Street Gangs’ radar, but mudlarks can always develop a second or third local square to cope with this. Beyond merely writing new ballads music or entertaining dramas, the city’s entertainers—often hungry and struggling to make ends meet—can be hired to compose, perform, and popularize works of art—ballad sheets, pamphlets, plays, posters, and works of propagandistic visual art (akin to William Hogarth’s)—with a political agenda. This is a step short of patronage, where characters explicitly hire a creative person to popularize a certain opinion among the public. For each 1000sp spent on a given work, there is a 10% of a major event being triggered: an Authority removed from office, a law repealed, a crackdown on a Street Gang or rival mudlark guild, etc. However, for each work where there is an 60% or higher chance of such an occurrence, the if the roll fails then a backlash will be triggered against the entertainer who generated the work, and ultimately his or her patrons. (That is, if a work is 60% likely to trigger the execution of the Mayor, it’s 40% likely to land the artist in prison and get the Mudlarks investigated instead. Once a work is 90% likely to achieve a goal, the chance of a backlash is 10%. If characters invest sufficiently for a guaranteed Triggered Event, there is no risk of backlash to them, but the chance of a backlash against the artist does not drop below 10%.) Note that unless the entertainer is already indebted to the characters or enjoys their patronage, the player characters will need to issue a bribe (see below) for the entertainer’s release, or risk investigation revealing their patronage (with probable legal consequences). 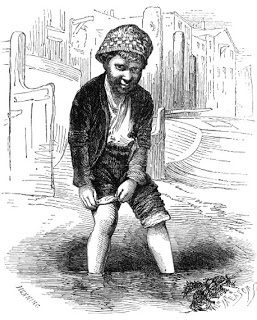 As they accumulate more wealth and power, mudlark guilds can cultivate contacts in the city, at differing degrees of expense, which can be used to deal with antagonisms, secure agreements and services, and instigate indirect aggressions against enemy Authorities, Street Gangs, or even other Mudlark Guilds. In cases of conflicts of loyalty offscreen, a contested roll is made, balancing the loyalty of the bribed individual to each party. If anticipated, this can be modified by social interactions (threats, cajoling, gifts, violence, etc.). All these numbers are rough estimates: bribes must be negotiated on the spot, and the risk to the recipient tends to increase the amount dramatically. “Permanent” bribe payoffs are not possible, although characters may gather sufficiently incriminating dirt on any character as to establish a Blackmail relationship without any bribe (or with only a minimal one) needed. All secrets used to blackmail NPCs must be uncovered during the course of play. It is up to players to recognize when compromising secrets have been discovered, to decide how compromising they are, and to time their use of this information to their advantage. Characters may or may not realize it, but bribes and blackmail—like magic—are quite risky business: once a relationship involving monthly payments begins, it likely needs to continue indefinitely, and all manner of trouble may ensure if payments stop, even just temporarily. Likewise, blackmailed individuals may be willing to go to astonishing lengths to free themselves from the yoke of compromising information: Mudlark guilds sometimes get burnt down in the night in retaliation for a blackmail scheme carried on too long, or milked too aggressively. Monsters. Even in our own world, cities are home to “monsters”: in a fantastical setting, cities would attract a certain type of monster—one able to got undetected among humans, and able to prey upon them in some manner. (Vampires, shape-changers, revenants, demons, incarnate spirits, and more all fit this bill.) Some of these literal “monsters” will also occupy positions within other antagonistic organizations as well. 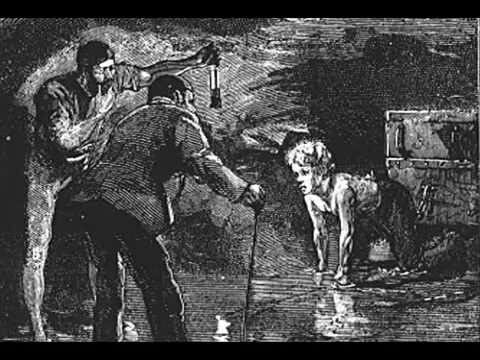 Other monsters may be introduced into the City by chance, or by other conditions—brought in unwittingly by merchants, carried into town by a clueless naturalist, and so on. The Authorities. The corrupt powers that be in The City know of the mudlark guilds, and dislike what they represent—the poor organizing into like-minded groups and trying to change the city around them—as well as fearing they essentially are, or are linked to, organized criminal syndicates and hotbeds of political radicalism. Street Gangs. 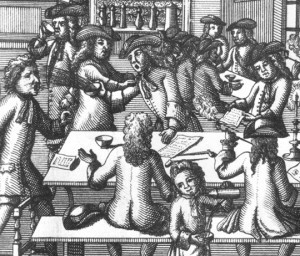 These are the “evil twins” of the mudlark guilds: like the Mohocks of early-18th Century London (or the Hawkubites who preceded them), they tend to engage in street crime essentially as a wanton pastime, taking pleasure in violence and mayhem, and predating primarily on the poor or weaker folk of the city. Street Gangs take special pleasure in undoing the advances achieved by the mudlark guilds: burning down their shared homes and the businesses they’ve invested in, and so on. The Haves. Folks who have what the mudlarks only dream of; they don’t like the mudlarks taking action to get it, either, and want them out of their neighborhoods, out of The City’s streets and into jails… or, maybe, just dead. The Highborn. Those who live in the upper echelons of the City’s society realize what it means when the poor are allowed to organize and agitate, and they are not willing to stand for it. They are especially fond of dirty tricks and playing upon the human weaknesses of those who run such institutions. The Clergy. The local religious authorities are not a monolith: some of the lower-ranking clergy like and support specific mudlark guilds, and are willing to intercede for those they believe are doing the City good; however, the higher-ranking clergy tend not to like the idea of children living without parents to beat discipline and control them. These individuals will take every opportunity they can find to portray the mudlark guildhouses as dens of iniquity, sin, and lawlessness, and push for the children living in them to be removed and made wards of the church. 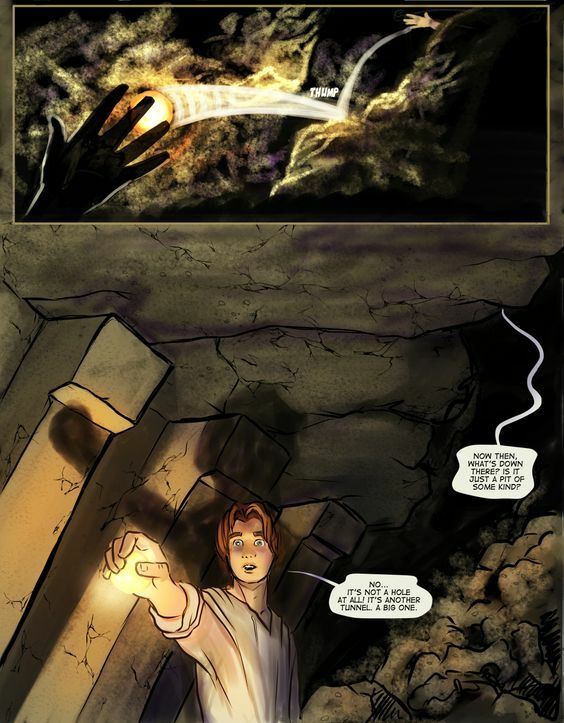 So, in your typical LotFP campaign, characters “go on adventures” by heading out into the wilderness and venturing into abandoned mines, ruined towers, crypts, dungeons… and you can still do that, because the City has plenty of that stuff within reach. However, we’re also going to try have more adventures within The City, related to The City, related to your mudlark guild. That also means that “downtime” is never quite going to be the same: Downtime is another part of the adventure in itself, the spur to other adventures, and a time when Problems come up. 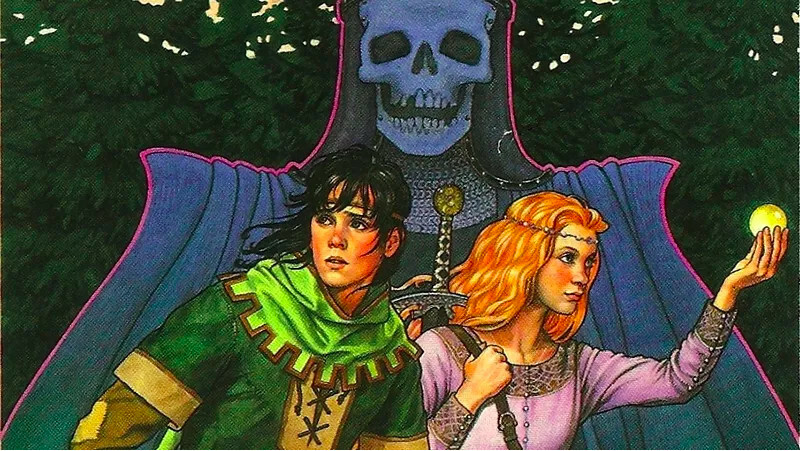 From a graphic novel adaptation of The Chronicles of Prydain, art by Dawn Davidson. Click image to see source page. On a purely pragmatic level, everyone has a money problem in The City: you need to spend at least 1sp a day just to get by while living there, and a few more if you’re seriously trying to level-up in terms of social standing, social connections, courtship, or, you know, enjoying yourself at all. That’s not a normal cost for Early Modern Europe, I know: the prices are inflated for totally sensible and reasonable reasons I won’t get into here. Besides that, stuff needs upkeep: the mudlarks’ guildhouse, your equipment, your body and mind… all that takes silver, not a ton of it, but a bit every day, relentlessly, forever. But there are also Problems, the ones that seem to crop up in twos or threes: conflicts in the guildhouse, and jobs that don’t get done because guildmembers are struggling with problems, and friends of the guild who need help with crises; rivalries that get out of hand, and the local magistrate under the thumb of one of the Street Gangs who orders your guildhouse ransacked and “searched” for illicit materials or stolen goods… not to mention, the stolen goods that are found, whether because you stole them, or they were planted while you were out. 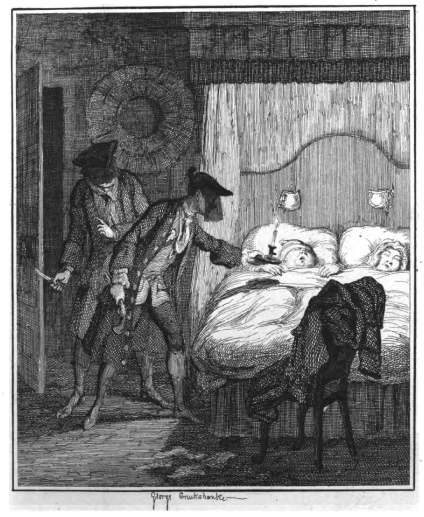 The local cunning woman is ill, and needs to be escorted across town to an expensive healer; or the way street kids in your part of town have started disappearing again between the hours of three and five in the morning. Someone comes to town—a new recruit who’s got a secret, a new monster lurking in the shadows, a highborn family of Haves who really have it in for you—or someone leaves town—guild members get stranded on adventures, or imprisoned by the Authorities or kidnapped by a Street Gang, or maybe they defect to other guilds, or fall foul of the monsters that lurk in the shadows of The City… or maybe even skip town, leaving a role to be filled. It’s a constant welter of fires to be put out, and that’s why even “downtime” isn’t really downtime in The City: you always have at least a problems to deal with… well, you can choose not to deal with them, ignoring these problems won’t make them go away. They rarely get better on their own. “Adventuring” isn’t the only way to make ends meet, and characters may sometimes need to take on menial or mundane tasks just to buy a day’s food and rest, especially in the time before they’ve managed to collect the resources to establish a guildhouse of their own, and when they’re recovering from a particularly rough or under-lucrative adventure. In such cases, loathe as they may be to do so, characters can go in search of “work,” which can range from collaborating with a gang of pickpockets at a hanging or play, to courier work, posing for artists, and selling ballad-sheets or vegetables in the streets… and, indeed, all the way to spying, assassination, infiltration and robbery, or worse. The nastier work is, of course, more lucrative… but also riskier, both in the short term and the long term. Still, it’s quite impossible to know what consequences will follow from any given job, and it’s also possible that poisoning an important baron into his grave will matter much less later on than an innocuous-looking package delivered to a strange-looking fellow in the dead of a winter’s night. But one thing is for sure: just like the way your characters choose to deal with (or not deal with) their Problems leads to consequences, all Work eventually has consequences as the game continues on. Likewise, between game sessions, rumors circulating in The City will occasionally be posted to a rumors Twitter feed devoted solely to our campaign. The feed is @obtenebrations on Twitter, but I’ll sort out how to hook it up to our Discord channel so you can see the rumors there. All of this is a draft, and a work in progress. We’ll see where it ends up. Let me know what you think. 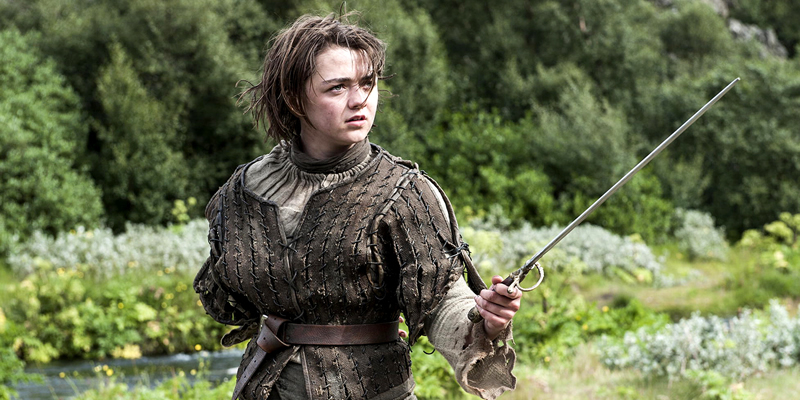 Okay, there’s one intersex character who doesn’t bother to correct anyone when they assume the kid is a girl.